2: Do 1 damage to any target. Rocket Launcher may not be used until it begins a turn in play on your side. If it is used, Rocket Launcher is destroyed at end of turn. 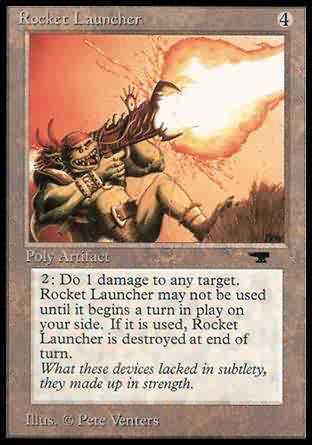 2: Rocket Launcher deals 1 damage to target creature or player. Sacrifice Rocket Launcher at end of turn. Play this ability only if you've controlled Rocket Launcher continuously since the most recent beginning of your turn. What these devices lacked in subtlety, they made up for in strength.